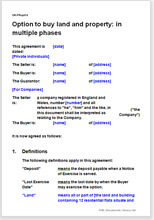 This option agreement is for a single deal where the buyer may exercise the option in phases. It is designed for any situation where the buyer may achieve a substantial increase in land value but only in stages - for example, a phased development of a residential site. The effect of phasing the deal in this way is that the land owner receives his proportion of the full value but the buyer can work piece by piece. This deal allows each party to maximise his share. To make it work, the area and location of each proposed phase must be identified on a plan. This document is suitable for buying any type of real estate, from agricultural land to derelict warehouses. You can use this agreement on any occasion when you need to await some event. It could be simply planning approval, or it could be resolution of a dispute, grant of a licence relevant to this land, or simply an offer of financing.